“We want justice – price too high! 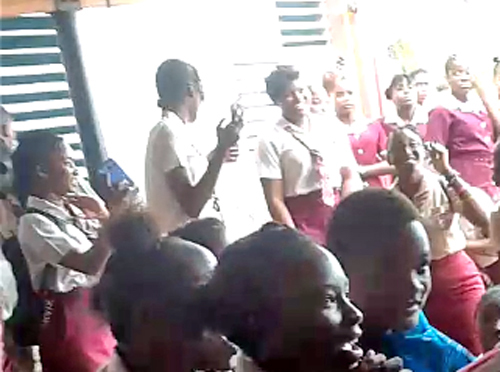 We want justice – price too high!” – The words which rang out loudly and clearly across the campus of the 42-year-old Herbert Morrison Technical High School in Montego Bay on Monday, as students protested what they deemed exorbitant price increases at the canteen operated by Tastee Limited. The students vented their disgust with the hike in prices, calling for an immediate roll back as they could not afford it and would not buy anything from the canteen with prices now out of their reach. One student leader at the school, who spoke on condition of anonymity, told the Western Mirror that the protest action was sparked by the fact that no notice was given of the increases and they are much too high for them to afford. The students insisted that they do not earn a salary and struggle with the limited funds they receive, so such high prices would mean no lunch for them. “We are unaware what could have triggered the overnight increases, which came upon us like Nickodemus by night. We simply cannot afford it. So, we won’t be buying anything from the canteen if the prices remain,” one male student indicated. Unconfirmed reports are that a boycott of the canteen by students saw no sales at the canteen on Monday and Tuesday. Meanwhile, Patsy Latchman-Atterbury, Group Chief Executive Officer of Tastee Limited, said the company initially communicated the price increases to the schools (at which they operate a canteen) and after feedback and due consideration, extended the effective date to November 19, 2018, allowing the schools five weeks to communicate with their stakeholders. She said the increase was triggered by multiple price increases in key raw materials and the company has absorbed all of these costs. The students in the meantime have vowed to continue their protest action for the rest of the week, insisting that they won’t relent until they see a roll back in prices.